Other photos: Profile 2 - Running, Profile 3, Companionway - Stairway, Master Stateroom 1, Master Stateroom 2, Master Stateroom 3, Master Stateroom 4 - TV & Cabinetry, Master Stateroom 5 - TV, VIP Stateroom 1, VIP Stateroom 2, VIP Stateroom 3, VIP Stateroom 4 - TV, VIP Stateroom 5, Guest Stateroom 1, Guest Stateroom 2, Salon 1 - Sofa, Salon 2 - Sofa, Salon 3 - Dinette, Salon 4 - TV, Master Head 1, Master Head 2 - Shower, VIP Head 1, VIP Head 2 - Shower, Guest Head 1, Guest Head 2 - Shower, Galley 1, Galley 2, Galley 3, Bridge 1, Bridge 2, Bridge 3 - Forward Seating, Bridge 4 - Bridge Seating, Bridge 5 - Port Side Seating, Bridge 6 - Helm Chairs, Bridge 7 - Helm Chairs, Bridge 8 - Helm Refrigerator, Bridge 9 - Bridge Air Conditioning, Bridge 10 - Helm Vents for AC, Bridge 11 - AC on Bridge, Bridge 12 - Helm Air Conditioner, Helm / Electronics & Navigation 1, Helm / Electronics & Navigation 2, Helm / Electronics & Navigation 3 - Garmin, Helm / Electronics & Navigation 4 - Electronics, Helm / Electronics & Navigation 5 - New Radar, Helm / Electronics & Navigation 6 - VHF Radio & Stereo, Helm / Electronics & Navigation 7 - Auto Pilot, Helm / Electronics & Navigation 8 - Tri-Data, Deck 1 - Bow, Deck 2, Deck 3, Deck 4, Engine & Mechanical Equipment 1, Engine & Mechanical Equipment 2, Engine & Mechanical Equipment 3, Engine & Mechanical Equipment 4, Engine & Mechanical Equipment 5, Engine & Mechanical Equipment 6, Engine & Mechanical Equipment 7, Engine & Mechanical Equipment 8, Engine & Mechanical Equipment 9, Engine & Mechanical Equipment 10, Engine & Mechanical Equipment 11, Engine & Mechanical Equipment 12 - Engine Hours, Electrical System / Equipment - Electrical Panel, Cockpit / Fishing Equipment 1 - Bait Station, Cockpit / Fishing Equipment 2 - Cockpit Freezer, Cockpit / Fishing Equipment 3 - Cockpit Engine Controls, Cockpit / Fishing Equipment 4 - Cockpit Table, Cockpit / Fishing Equipment 5 - Tackle Drawers, New 2016 - Helm Cover, New 2016 - Cockpit Sunshade, Rear Profile 1, Rear Profile 2, Rear Profile 3, Rear Profile 4 - LED Lighting. A lush and spacious three-Stateroom interior, three-Head floorplan with a full beam Master Stateroom. An elevated Galley and dinette are a step up from the Salon on the Deckhouse level. The Flybridge has a wrap-around Helm with rod storage and seating for six in an air-conditioned Bridge. 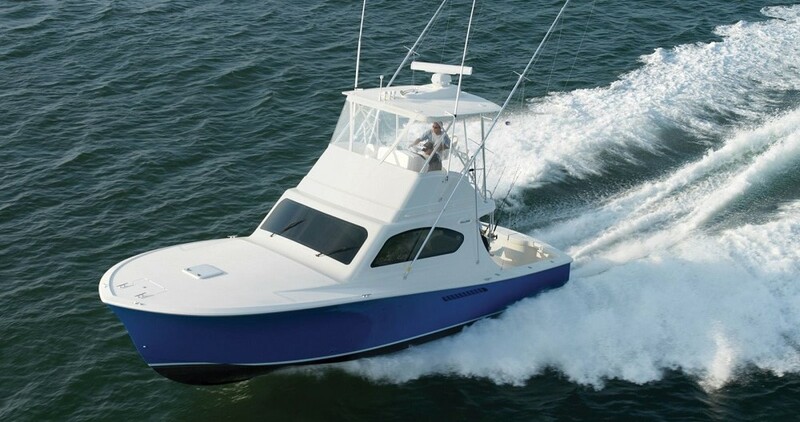 This is a fast Sport Fisherman - A down-sized version of the Ocean 60 Super Sport with slightly reduced Cockpit dimensions. "LADY JAYNE" HAS HAD MANY UPDATES THE PAST COUPLE OF YEARS!!! DEFINITELY A "MUST SEE"
ANOTHER MAJOR PRICE REDUCTION FOR QUICK SALE!!! CALL TODAY!!! SYS Yacht Sales is pleased to assist you in the purchase of this vessel. This boat is centrally listed by South Jersey Yacht Sales.